So, it seems to have been quite a long time since I’ve posted. Let me get you caught up with what I’ve been doing this month, before I move on to my new adventures. In January I spent my days working with the computer training guy. He showed me some of the computer programs that are used by translators, and then I was able to help him with some small projects. I learned how to take old text files of word lists, compiled by translators sometime in the last 50 years, and modify them so that they could be imported into a program called Toolbox, which is used to create dictionaries. From Toolbox, information can be formatted and exported into Word, where it actually looks like a dictionary. The Toolbox files can also be imported into a program that creates an html dictionary that can be put up on the web. So, in January I worked on a number of these old files, which will be processed and put up on a PNG languages website. One other project that I worked on involved taking a translation of most of the books of the New Testament that had been entered into Word, and changing the formatting so that they could be imported into a program called Paratext. Paratext is a translation friendly program that uses codes to mark chapter and section headings, verses, etc. The translation then can be sent directly to a print shop, and they use the codes to consistently format the translation for printing. Evenings and weekends were spent building friendships with others. God has over and abundantly answers prayers for encouraging friendships. I am continually amazed by people from all different backgrounds that God has brought together to do and support the work of Bible translation! Friends from Australia, Costa Rica, Germany, USA and the UK to name just a few, that have come to work as pilots & plane mechanics, teachers & school administrators, auto/motorbike mechanics, literacy workers, computer technicians, translation consultants and language surveyors. What an awesome place to live!! 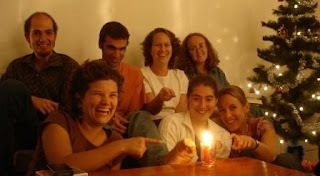 This picture is a bunch of friends enjoying a candle we created.